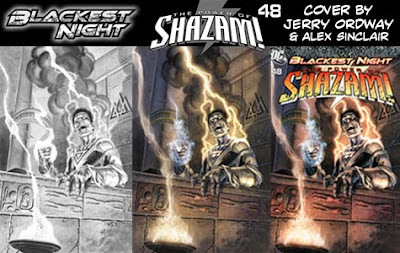 In January, as part of DC's Blackest Night event, 8 classic titles rise from the grave for one more issue. 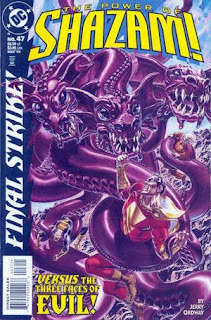 However over a dozen books can be a bit of a hard ask for any New Years comic budget, so to help you decide which to grab, here's the wrap on the last in our 1-0-1 series, the rise of The Power of Shazam #48. WHY YOU SHOULD CARE: Having once rivalled Superman in terms of popularity, the Marvel Family are no longer who they once were. Deemed unworthy by the wizard Shazam, a powerless Billy and Mary Batson can no longer call upon the might of Captain or Mary Marvel, and it is now Freddy Freeman (the former Captain Marvel Jnr) who alone keeps the Marvel family legacy alive. With Black Adam: The Dark Age, and JSA it seemed DC was building to something big with the Marvels. Now after a mysterious absence writer Eric Wallace picks up the Batson's and runs, aided by the art team of Don Kramer and Michael Babinski. When Osiris rises from the grave demanding a pound of flesh, can Black Adam be far behind? Find out in The Power of Shazam #48!